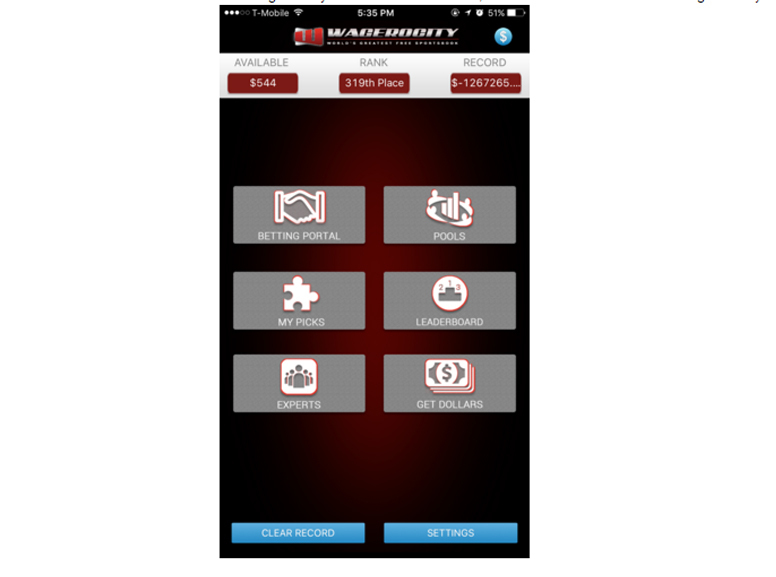 Wagerocity is a virtual fantasy sportsbook that allows participants to take part in pools and large contests for virtual dollars and prizes. 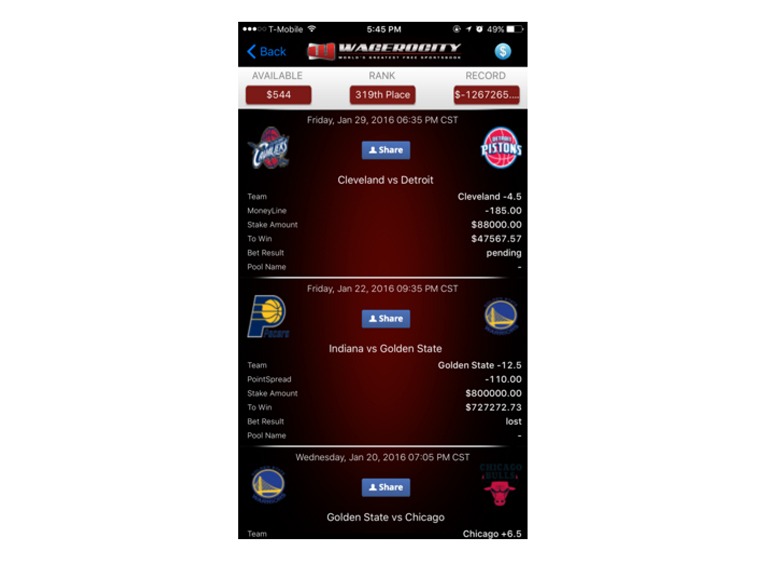 Wagerocity is a startup fantasy sportsbook company. They wanted to create a free fantasy sportsbook that allows users to make sports bets through the virtual dollars. Giving users the thrill of participating in a sportsbook without the actual risk associated with it. Users would be able to bet virtually on a multitude of sports including Football, Basketball, Baseball, Ice Hockey, Soccer and more. The dashboard is the start screen of the app where the user can navigate through the different screen within the application. The user is shown right away their available balance, their record and rank for the “wagers” they have made. The betting portal allows the user to browse available matches by sport and make their picks. My Picks Allows the user to see their previous wager history and see which matches they have won or lost recently. Users here can follow and buy daily picks from industry experts. Users have the options to read about the experts making the pick and their previous experience in the industry. They can also see the game they have made picks on without seeing the actual selection. Users can create private groups or pools to create competition on a more closed basis. 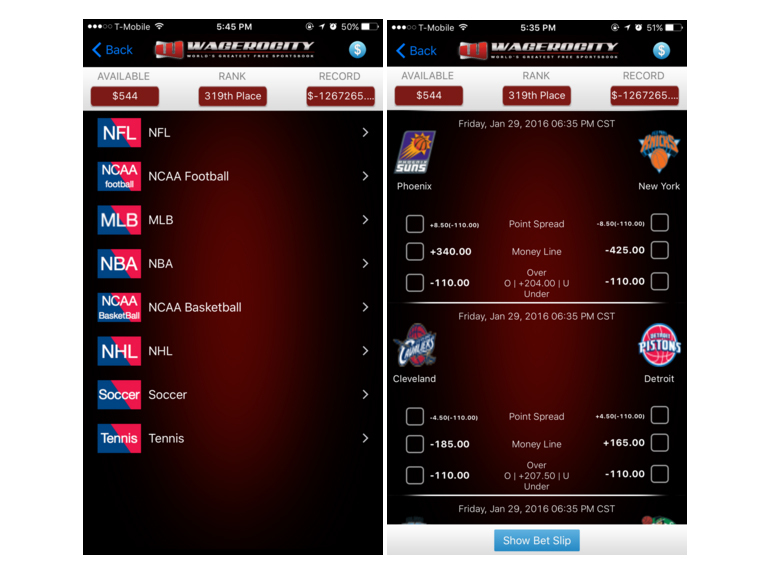 Wagerocity has set up these pools as a way of isolating the wagering to specific sports and allocating prizes to winners during a selected time frame. 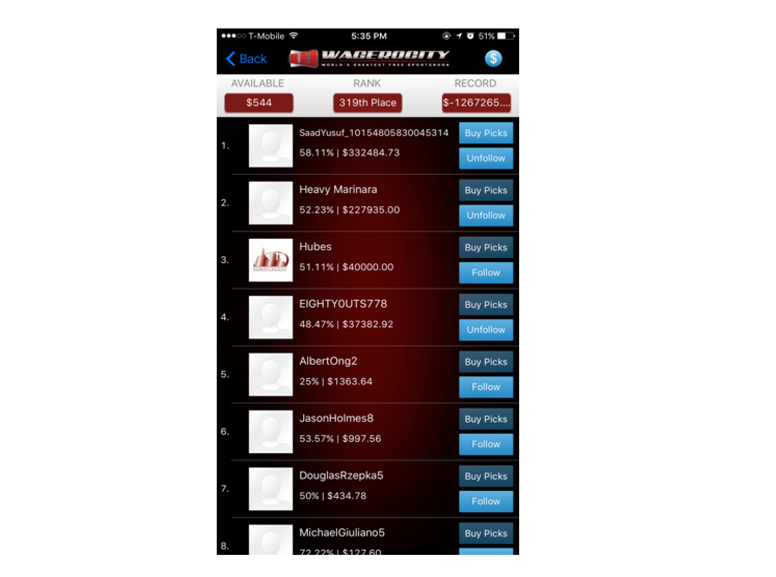 Users can see the most successful users of the app through the leaderboard. They have the option to see the overall leaderboard or just by sport. Users can purchase virtual dollars once they run low on available balance.